The sinking of the Titanic on its maiden voyage in 1912 captured the world's attention a hundred years ago and still holds it today. Although it was bound for New York, more than 100 passengers aboard the ocean-liner were headed for Canada. Titanic Lives delves into the unique stories of ten of those passengers. The sinking of the Titanic on its maiden voyage in 1912 captured the world's attention a hundred years ago and still holds it today. Although it was bound for New York, more than 100 passengers aboard the ocean-liner were headed for Canada. Titanic Lives delves into the unique stories of ten of those passengers. Some were rich - like railroad tycoon Charles Melville Hays and a scion of Montreal's Molson family. Others were not, and would have been lost to history had they not been a part of this unforgettable story. From the scandalous romance between Montreal's Quigg Baxter and his French showgirl mistress, to one woman's search for her toddler and husband as the life boats were being launched from the decks, this book gives its readers a glimpse into the lives of those who took that fateful voyage on the Titanic. You will hear about Paul Chevre, renowned French artist travelling to Montreal to reveal his latest sculpture, and Arthur Peuchen, the wealthy chemist and lumber king whose last-minute decision to board the Titanic turned him into both a hero and a target. Be it nursemaid, cabaret dancer or ex-soldier, Rob Rondeau weaves together the unique and compelling stories of ten people sharing one common thread - they were all on board the Titanic, destination Canada. 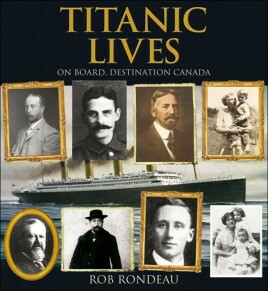 Rondeau's book concentrates on just ten of the thousands of passengers and crew who took that faeful journey in 1912. The detail is remarkable, the photographs eerily chilling, and the whole experience contributes such a lot to the Titanic canon. Superb.